There are times when I suffer from pangs of regret about switching over to Linux from Windows (not enough to make me switch back though). One of them, as I wrote earlier, was for online music stations. 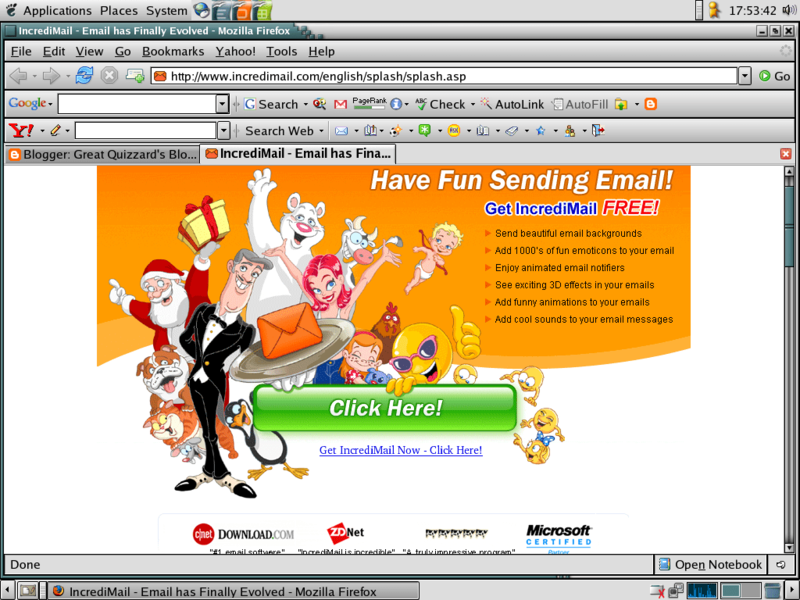 The other thing I miss very dearly is my favorite email client, IncrediMail. Indeed, some may say that email clients have become almost redundant these days, what with killer web interfaces like that of Yahoo! Mail Beta. The other (and more relevant) reason is that these days, hardly any email service provider gives away POP/IMAP access away for free to users. Notable exception – Gmail. Despite this, I still use an email client (in certain circumstances) with whichever provider still gives me the liberty of that feature. I tried quite a few ones: Netscape (good integration with browser? somewhat), Eudora (don’t mention it), Microsoft Outlook Express (pass the vomit bag please; no link required) and Mozilla Thunderbird (well, all those extensions can come handy). But what wins my vote is the incredible IncrediMail. In fact, after using this proggie, I feel, ‘Was I away in Mars all these years looking for a good email client?’ Or closer still, ‘Are the software developers of other email clients on a vacation to Mars, or are aesthetically-challenged?’ Because one look at IncrediMail, and it will take your breath away. Really cool emoticons. And I mean it. No kidding. Email backgrounds. Yahoo! calls it stationery. Looks really cool, and you can impress your friends with themed mails. Animated email notifiers. Why just have a drab popup saying ‘You got mail’? Have your personal (virtual) butler say it to you. Animations for email messages. It rocks! 3D effects while opening and sending mails. Just looks nice. The USP of this program is the graphics overkill, and ease-of-use; it just looks so nice. Kudos to the designers. Please note, that at full blast, it’ll obviously be more of a RAM hog than it’s older email client cousins, but it’s worth it. Anyway, Windows users will have to upgrade a lot for Vista. And you can turn off individual features you don’t want. Apart from this, and the easy multimedia integration, it is also very easy to use. In a stroke of genius, the program will automatically load settings, and take you to a help page, for most email providers. So you don’t have to manually lookup and enter all info about ports, etc. Just give your, let’s say, Gmail ID, and it will automatically take the settings for Gmail. Indeed, why don’t others do it? For common providers, is it not a good thing to have common settings at call. It must have taken only a small time on their part, but results in higher customer satisfaction. The interface is really well designed and easy to understand. Please note, that there are certain features that require a fee-based membership, but that’s only for very advanced uses. There are many more features I have not mentioned, but check them out yourself. IncrediMail is the perfect solution for beginners, and expert users alike, or stressed out geeks (like me ;) ) who don’t like a pesky little annoying programs (i.e., other email clients). And if you were about to say ‘spyware…’, don’t, because it’s a CNET-appreciated, ZDNet-liked, Microsoft-certified program.